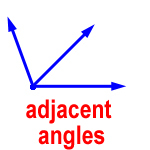 An acute angle is smaller than a perfectly square corner. 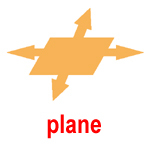 The direction is given as clockwise or counter-clockwise. 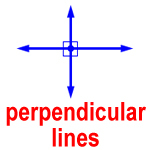 An obtuse angle is bigger than a perfectly square corner, but smaller than a straight line. 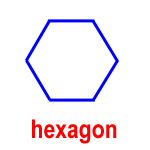 Triangles, squares, and rectangles are examples of polygons. They are all closed shapes. A right angle makes a perfectly square corner. A straight angle makes a perfectly straight line. 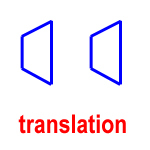 Examples of transformations are translations, reflections, and rotations. 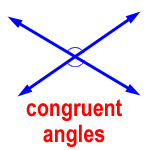 Vertical angles are always congruent angles. They have the same measurement. 1. 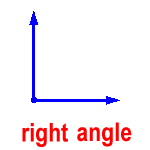 Match the type of angle with its picture. 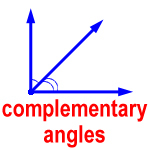 Check the box or boxes that describe each set of angles. There may be more than one correct answer. 6. 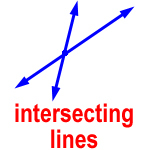 What are two lines that never meet called? 7. 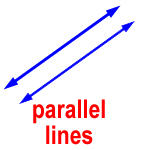 What are two lines that meet to form four right angles called? 8. What is a flat surface that extends with no end? 9. 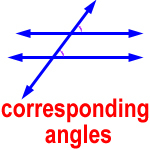 Which two angles are corresponding? 10. 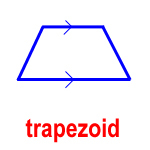 Which two angles are vertical? 11. 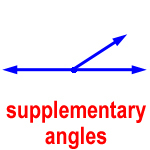 Which two angles are supplementary? 12. 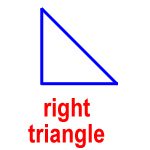 Which kind of triangle is this? 13. 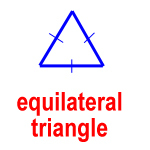 Which kind of triangle is this? 14. 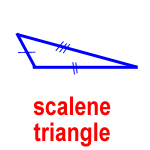 Which kind of triangle is this? 15. 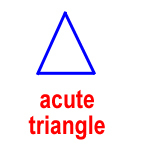 Which kind of triangle is this? 16. 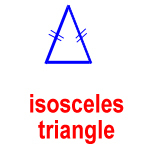 Which kind of triangle is this? 17. 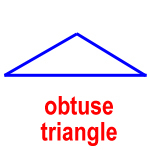 Which kind of triangle is this? 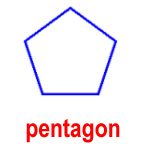 Match the polygon with its name. 25. 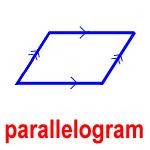 These two polygons are ___. 26. 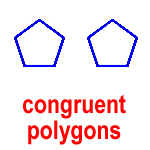 These two polygons are ___. 27. 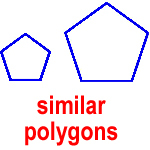 These two polygons are ___. 28. The transformation shown here is a ___. 29. 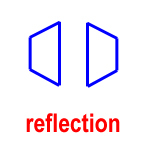 The transformation shown here is a ___. 30. The transformation shown here is a ___. 31. What is the angle of rotation in this rotation? 32. What is the angle of rotation in this rotation? 33. 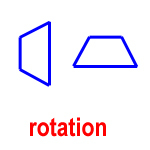 What is the angle of rotation in this rotation? 34. 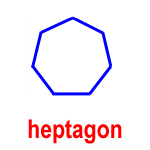 Does this figure have line symmetry? 35. 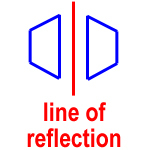 Does this figure have line symmetry? 36. 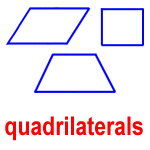 Does this figure have line symmetry? 37. 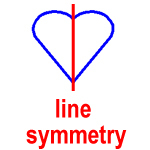 Does this figure have line symmetry? 38. 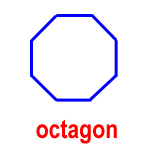 Does this figure have rotational symmetry? 39. 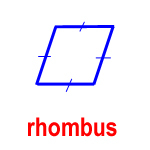 Does this figure have rotational symmetry? 40. 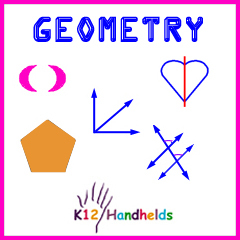 Does this figure have rotational symmetry? 41. 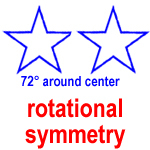 Does this figure have rotational symmetry?